Peter Cushing plays the Doctor in a film that exists outside the TV show's continuity. In the early 1960s, American producers Milton Subotsky and Max Rosenberg founded the England-based production company Amicus Productions, a company that is generally perceived as something of a Hammer Studios wannabe. Hammer, also a British company, were making wildly popular horror films at that time, so Amicus also started pumping out horror films that casual viewers could mistake as Hammer productions. But a few years into their existence, Amicus pulled off quite an impressive feat when they got their hands on the rights to make feature films based on stories from the hit television series Doctor Who. 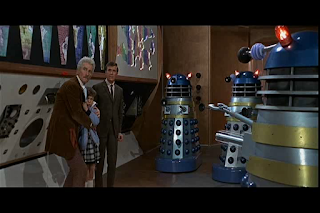 Specifically, Amicus chose to make films based on stories featuring the creatures known as the Daleks - a wise decision, given the children of England were experiencing "Dalekmania" after being introduced to these things on their TV screens. These Amicus movies would give fans the chance to see the Daleks on the big screen. And in color! The idea had its appeal, but it was also a uniquely weird endeavor, because the films Amicus made would exist outside the continuity of the television series. This wouldn't be like what 20th Century Fox did with the '60s Batman series, where a Batman feature film starring the show's cast was released in theatres during the hiatus between the first and second seasons. Amicus's movies - which were called Dr. Who instead of Doctor Who - would be something entirely separate. A different cast, a different doctor. Amicus's first Dr. Who film, Dr. Who and the Daleks, arrived in theatres during the one month hiatus between seasons two and three of Doctor Who, and it stars an actor who would have been a perfect choice to play the Doctor on the show: Peter Cushing, who's best known for his roles in Hammer horror movies. Cushing's Doctor is not the man from the TV, he's not a man from a different world who has been travelling through space and time in a shape-shifting machine. He's from Earth, and he's not called "Dr. Who" simply because nobody knows what else to call him. He is a doctor whose last name is Who. This Who fellow is an absent-minded professor type who has build a time machine called the TARDIS (that stands for Time And Relative Dimension In Space) that's disguised as a police box and stands in his back yard. The Doctor on the TV show has one granddaughter named Susan, but this one has two - a preteen named Susan (Roberta Tovey) and a teenager named Barbara (Jennie Linden). When Barbara's bumbling boyfriend Ian Chesterton (Roy Castle) comes over to their place one night, Who takes the opportunity to show him the TARDIS... And when Barbara greets Ian with an embrace inside the machine, they fall back against a lever and end up transporting them all through time and space. Susan, Barbara, and Ian are the names of the Doctor's original travel companions on the show, but the characters are very different. Susan was a teenager (and from the same alien world as her grandfather, of course), and Barbara and Ian were schoolteachers. Once the TARDIS materializes on another planet, anyone who has watched the first Dalek serial will find this story very familiar. Milton Subotsky wrote the screenplay for the film, and beyond introducing these new versions of the characters all it required doing was condensing the events of the serial down into a feature running time. Dr. Who and the Daleks has the exact same story as The Daleks, but what took seven 25 minute episodes to play out on TV takes just 82 minutes to play out here. All the major moments are here. The travellers arrived in a forest that has been petrified by some sort of great heat, which we'll come to find out was a bomb blast that has left the area irradiated. When they spot a city in the distance, Who fakes a mercury leak problem in the TARDIS so the group will be forced to walk to the city and check it out. That's where they encounter the Daleks - and the slight re-design given to the robot bodies the radiation mutant creatures reside within does give them a bit of a cooler appearance. The Daleks look good in color, and they have differing paintjobs. They still have toiletry plungers for arms and that still looks ridiculous, but Daleks need their plungers. 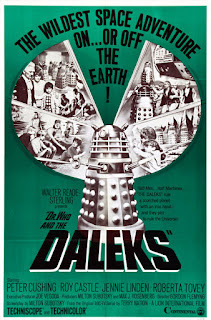 Suffering from radiation poisoning, the Earthlings are saved by a race called the Thals, who have an anti-radiation drug the Daleks never had access to. These Thals look like regular people, albeit ones who put on their facial makeup very heavily, and the Daleks intend to destroy them. It was a war that was fought between the Daleks and Thals long ago that turned their planet into an irradiated mess. Soon the Daleks are planning to boost the planet's radiation level even further with the detonation of another bomb, which will wipe out the Thals. And since the part Who removed from the TARDIS to strand them on the planet has fallen into the plunger-hands of the Daleks, our travellers can't just run off back to Earth to get out of this trouble. They have to team up with the Thals to thwart the Daleks and get their piece back. Watching Dr. Who and the Daleks simply tell the story of The Daleks all over again is a strange experience. It's weird to watch these different characters that have the same names as the characters we know, to see the same things happen but at a quicker pace, and to see the events occur within something that often has a bit of lighter, more comedic tone. And in color. 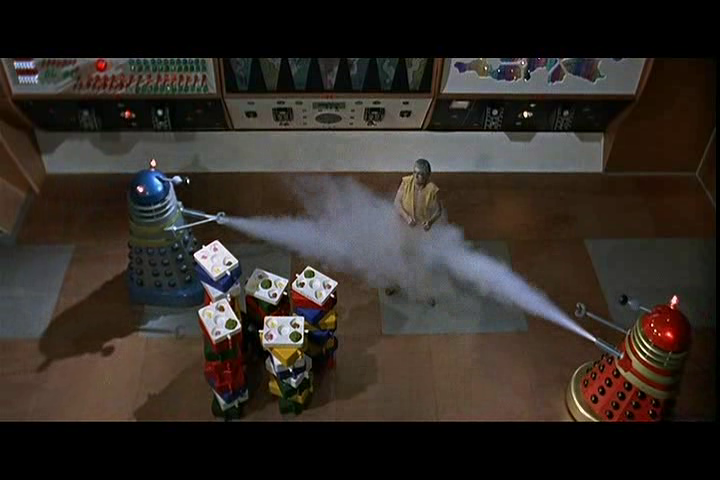 But within this strangeness, Dr. Who and the Daleks is quite an enjoyable film to sit through. If you think too much about it, you might start to wonder why this movie even exists. Some fans might be disappointed by it, and maybe look down on it just because it's not like the TV show, but if you can separate the two and take the movie on its own merits, it's entertaining. It's a fun oddity.